People in Wampar in Huon Gulf and Wain-Erap in Nawaeb now have a new market inclusive of facilities like good shelter, water and sanitation to ensure they sell their fresh produce in comfort and security. For a long while local women have been selling their produce under the scorching sun of the Markham plains and frequent rains. In view of the Lae-Nadzab urban development plan 2016-2022, the population in Yalu, Munum, Nasuapum, Gabsongkeg and Gabmazung villages in Wampar has increased rapidly in the last decade due largely to an influx of settlers. The influx also gives rise to various human needs as well as illegal practices. Many people acquired customary land, built homes and settled. Similarly various investors have set up business operations there. As for the proposed Nadzab township, Morobe provincial government and its lands and physical planning division are yet to negotiate with customary landowners to acquire land for a properly planned township. The plan will have to encompass basic and essential services such as health, education, water and sanitation, electricity, feeder roads, banking services, police, fire services, shops and markets, garbage disposal sites, public parks and amenities. But there is already a significant population growth along the Lae-Nadzab corridor which has overtaken any planning for essential services. Many now depend on bore and rain water. Among the investors in the Nadzab is the Chinese-owned B&F Ltd supermarket which opened in 2016 followed by a Bangladeshi-owned shop in 2017. Many national and foreign investors are establishing their operations farther north towards Erap Bridge. These investments created a bustling centre for locals to sell their fresh produce, buai, and cooked food and handcrafts at the gateway market leading to Nadzab Airport. Wampar Local Level Government manager Joe Paru and police also reported that the market had been a haven for drug and homebrew sellers. Then B&F managing director Jason Lin realised the need for a good market facility to cater for locals. Lin shared his blessings with the locals and spent K275,000 to build the new market facilities which include the shelters, water, toilets, car park and a space for a mini police post. Obviously the new market would also save time and money for women from Wain, Erap, Leron, Wantoat and the Markham plains who do not have to travel all the way to Lae city to sell their vegetables and other produce. These women travel by PMV trucks from interior Wain-Erap and Leron Wantoat. Others in the Wampar LLG walk to the main highway and those from either side of Lower Watut River use dugout canoes to get to 41 Mile or Gabmazung then get on PMV trucks to Lae. By the time they reach the city market all vending spaces would be occupied already and they have to jostle to find places to sell. The new Nadzab market also complements the Dangke market at 41 Mile and 40 Mile market. These markets serve thousands of employees from Sasiang Farm, Rumion, Bismarck, Coastal Solutions, Zifasing Cattle, Wawin National High School, Markham Farm, Erap Trukai farm and Erap Department of Agriculture and Livestock station plus traveling public along the Highlands Highway. The Dangke market is the bustling centre for tulait-tulait (sunset-sunrise) travellers that spend thousands of kina on food and drinks. Nawaeb MP Kennedy Wenge was on his way from Lae to Nadzab to fly to Port Moresb to attend the Parliament session on July 16. Instead, he was excited by the crowd at the new market. He drove in and parked his vehicle to observe what was occurring under the scorching Monday sun. Though not invited but as the MP, Wenge was soon ushered to the grandstand representing eight Morobe MPs and Governor Ginson Saonu to make a speech. “That former Nadzab market was dominated by mothers from Nawaeb, I must be honest, to sell their vegetables and banana’s but under the sun and rain,” Wenge said. “On behalf of Morobe MPs who are absent, I sincerely appreciate Jason Lin and B&F Ltd; I now declare this market as Hanpaus (wallet) market,” Wenge said. 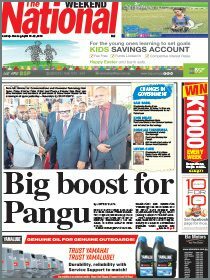 “One can name all types of industries on earth but the hanpaus industry is the core of our family household; meaning our wives, mothers and sisters bring and sell their fresh produce at markets, fill their wallets and return home,” Wenge said. Lin negotiated with Orognaron clan leader Michael Maliaki for the land and his company built the market as part of its community obligation to landowners and Wampar people. Maliaki said that much of the Orognaron land the clan owns around Nadzab area was only leased for developmental purposes in line with the Nadzab township plan as the ever expanding Lae city was encroaching into Wampar. “Orognaron clan has the incorporated land group (ILG) certificate,” Maliaki said. “Lae is encroaching into Wampar; we have two supermarkets and now we have a proper market house and it is the beginning of many good things to come,” Maliaki said. Morobe provincial police commander Alex N’Drasal was critical about daily hygiene and regulations at the market. He said that Nadzab airport was the only gateway for national and international visitors, tourists and investors to and from Lae thus hygiene and disease prevention standards have to be maintained daily. “To protect the image of Lae and Morobe, illegal trading of homebrew, drugs, prostitution and adultery are not encouraged in this market,” he said. The market committee and security guards are required to enforce stringent health and hygiene rules including law and order. “Visitors may need souvenirs apart from fresh foods and drive in therefore vendors, both women, men and girls selling produce and artifacts must wash properly and dress neatly. Brush your teeth and smile when customers approach you,” N’Drasal said. 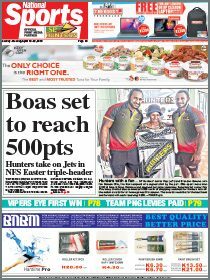 B&F is possibly the first ever company in this part of the country to share their blessings and build a market to serve locals and the travelling public to and from Highlands and Mamose region as well as international visitors to Lae. “Jason realised the millions of kina travelling up and down day and night along this highway and he alone cannot collect it to become richer from this supermarket therefore he built this market for locals to become rich as well,” N’Drasal said. N’Drasal will discuss with Huon Gulf administration and Wampar local level government the need for a police post.